Lyme disease is a clinical diagnosis—based on your medical history, symptoms and exposure to ticks. Because the typical diagnostic tests for Lyme are so insensitive, a negative test result does not mean you don’t have Lyme. There are many reasons why someone who actually has Lyme may have a negative test result. There may not have been time for antibodies to develop; the immune system may be suppressed; or the person may be infected with a strain the test doesn’t measure. Lyme disease is known to inhibit the immune system and 20-30% of patients have falsely negative antibody tests. Tests can not only help to diagnose a disease, but also to manage an illness. A good test can help a doctor assess the severity of disease, estimate the patient’s prognosis, monitor the course of disease progression, stability or resolution, detect relapse, and select drugs or adjust therapy. Unfortunately, a test with this capability does not exist for Lyme disease. The most common diagnostic tests for Lyme disease are indirect ones. They measure the patient’s antibody response to the infection, not the infection itself. The two most-used antibody tests are the enzyme-linked immunosorbent assay (ELISA) and the Western blot. The CDC recommends that doctors first order an ELISA to screen for the disease and then confirm the disease with a Western blot. During the first four-to-six weeks of Lyme infection, these tests are unreliable because most people have not yet developed the antibody response that the test measures. Even later in the illness, the two-tiered testing is highly insensitive missing roughly half of those who have Lyme disease. Two-tiered testing uses two tests. The first is a screening test that should detect anyone who might have the disease. Tests that do this well have are regarded as having high sensitivity. This test is followed by a second test that is intended to make sure that only people with the disease are diagnosed. Tests that do this well have high specificity. Because of this, LDo recommends the patients and physicians skip the ELISA and go straight to the Western blot. Labs performing a Western blot use electricity to separate proteins called antigens into bands. The read-out from the Western blot looks like a bar code. The lab compares the pattern produced by running the test with your blood to a template pattern representing known cases of Lyme disease. 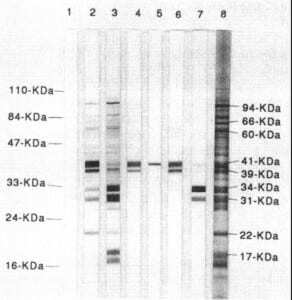 If your blot has bands in the right places, and the right number of bands, it is positive. The CDC requires 5 out of 10 bands for a positive test result. 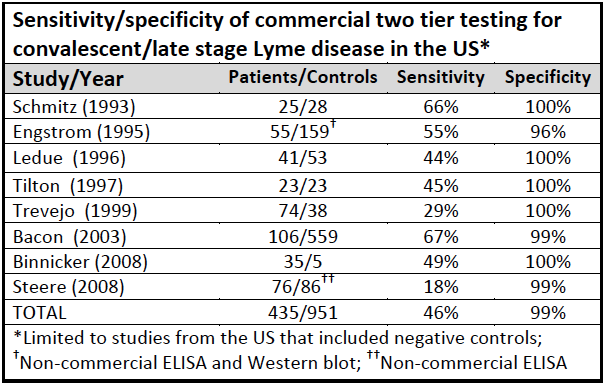 However, because some bands on the Western blot are more significant than others your doctor may decide you have Lyme disease even if your Western blot does not have the number of bands or specific bands recommended by the CDC. Different laboratories use different methods and criteria for interpreting the test, so you can have a positive test result from one lab and a negative test result from another. For a comprehensive explanation of the western blot test, download this PDF. To view an interpretation of the western blot test, download this document. Three other tests that may be used to diagnose Lyme disease are polymerase chain reaction (PCR), antigen detection and culture testing. They are called “direct” tests because they detect the bacteria, not just your immune response to it. PCR multiplies a key portion of DNA from the Lyme bacteria so that it can be detected. While PCR is highly accurate when the Lyme DNA is detected, it produces many false negatives. This is because the Lyme bacteria are sparse and may not be in the sample tested. Antigen detection tests look for a unique Lyme protein in fluid (e.g. blood, urine, joint fluid). Sometimes people whose indirect tests are negative are positive on this test. Culture is the “gold standard” test for identifying bacteria. The lab takes a sample of blood or other fluid from the patient and attempts to grow Lyme spirochetes in a special medium. Although culture tests are generally accepted as proof of infection, the CDC has advised caution on the only commercially available culture test developed by Advanced Laboratory Services. LDo recognizes that the test is new and requires further validation in other studies. However, we believe that informed patients should be able to choose the test if they prefer. Choice is particularly important given the low quality of Lyme disease tests generally. Although the CDC recommends that patients use “FDA-approved” tests, LDo does not support this restriction because FDA approval is not required to perform clinical testing and the FDA tests currently on the market have low sensitivity. The US Centers for Medicare & Medicaid Services (CMS) requires tests without FDA approval to undergo a rigorous certification process. CMS regulates all laboratory testing (except research) performed on humans in the U.S. through the Clinical Laboratory Improvement Amendments (CLIA). CLIA certification is designed to ensure quality laboratory testing. All clinical laboratories must be properly certified to receive Medicare or Medicaid payments. CLIA covers approximately 244,000 laboratory entities. Two highly specific bands (OspA and OspC) are not included in the CDC bands because they were used for vaccine development. Your doctor may want to know if you have antibodies directed towards those proteins. A few labs test for them. LDo recommends that you use a CLIA-approved lab that specializes in testing for tick-borne diseases and reports all bands on the Western blot. The healthcare professional ordering the test must ask the lab to report all bands except in the case of IGeneX, which automatically reports all bands. Blots may still vary in sensitivity.